The Blackhawks Warriors traveled to Tampa Florida this year to take part in the USA Disabled Festival for the fifth straight year. The Warrior division has grown quickly through the years. This year the Fest had twenty Warrior teams registered. Fielding one team this year, we were entered in the Warrior ”B” Division. Thursday’s opening game proved to be a difficult match since travel delays in Chicago didn’t get the team to Tampa until 1-1/2 hours before game time. Matched up against a strong Capital Beltway Warrior team from Virginia, we got off to a slow start. Beltway jumped out to a 4-goal lead in the first seven minutes of the first period. Billy Davidson opened our scoring banging home a rebound of Justin Wigg’s slapshot from the blue line. Pete Manning closed the gap to two goals with a booming slapshot off a feed from Chris Tran at 7:30 of the second. Capital Beltway answered that with a goal of their own to take a 5-2 lead into the third. Chris Tran scored his first of the tournament on a short-handed tally at 7:54 of the third. Kevin Sharwarko scored our fourth goal at 14:03 of the third on a rebound of an Anthony Baasch shot. Capital answered with one more to make the final 6-4. Nick Zefeldt kept the game close with numerous outstanding saves, as we were outshot 34-13. Eleven penalties tilted the ice for Capital throughout the game. Game 2 on Friday turned out to be a hard-fought battle against the newly formed, host team Tampa Bay Lightning. Using some fill-in players from Buffalo, it was a fierce game form the start. Tampa jumped out to a 2-0 lead 4 minutes into the game. Pete Manning closed the gap to 2-1 at 4:07 of the first on an unassisted goal. Tran scored our second goal at 14:36 of the first with great playmaking by Bill Lipke and Chris Polcyn. From there it was all Blackhawks Warriors. Scoring 4 more times in the second and third periods. Lipke got his first on a nice rebound of a Jim Otzko shot. Brian Moore got his first on a nifty stickhandling drive through all the Tampa players. Jeff Jucha added a third period goal with an assist from Ted Haras and Polcyn finished the scoring with assists from Haras and Wigg. The game ended on an ugly note with a brawl that led to 5 players from each team getting a one game suspension for fighting. Our Game 3 was a must win to get us into the semi-final round. Matched up against the Motor City Warriors, we were without the services of five of our top players. Ted Haras opened the scoring at 4:18 of the first with a nice move that beat the defensemen and fired a wrister past the Motor City goalie. Motor City answered that with a goal of their own at 2:22 of the second. The game remained tied the rest of the way. The game went to a shootout where Justin Wigg was able to dent the net for the game winning goal. Zefeldt held us in this one again with some acrobatic saves, stopping all three shootout attempts he saw! My hat’s off to all the players in the third game. They dug down deeper than was thought possible to win this game. Everyone skated every shift and never gave in. If we wouldn’t have won this game, our tournament was over. Instead these guys gave it their all and let us live to play another day! We matched up against the Pittsburgh Warthogs. The team we beat to win the Warrior Classic earlier this year in Las Vegas. The two teams traded goals in the first and early second periods. Chris Polcyn opened the scoring 30 seconds in with a nice feed from Chris Tran. Tran gave us a 2-1 lead early in the second with an unassisted goal. After that we took control. Polcyn got his second of the game assisted by Brian Moore. Davidson and Haras scored goals 4 and 5 assisted by Justin Wigg and Jeff Jucha. And Polcyn capped the scoring with a shorthanded goal for his hat trick! Final 6-2. A repeat of our first game. We got down early, trailing 4-1 by the end of the first. Our goal was scored by Chris Tran, assisted by Billy Davidson. Kevin Sharwarko opened the second period with his second of the tournament at 3:20 assisted by Davidson again. Capital answered that with their own before Anthony Baasch finished the scoring finishing the second period. It was a tough fought battle as we expected, but we won’t hang our heads. Finishing second in the Nation in a tough “B” division is quite an accomplishment. See you in Pittsburgh next April!! Ken McCudden speaking to the guys pregame. Our annual United Center day began a little differently than usual. Coach Jecmen was able to arrange a locker room visit by the Columbus Blue Jackets Assistant Coaches Kenny McCudden, Brad Larsen and Brad Shaw. Kenny had joined us at one of our practices last summer to run a power skating session for the Warriors. A session they didn’t forget! The Blue Jackets extended their generosity by passing out hats and t-shirts to the players. A great visit with some great coaches. The game against Team Pareti was a tight fought battle from the initial puck drop. The Blackhawks Warriors jumped out to an early lead on an unassisted goal by Brian Moore. After picking off a pass at his blue line, Moore was able to use some flashy stickhandling to weave through the defenders and fire a quick wrist shot past the goalie right arm to make the score 1-0. The lead held until the 14:34 mark of the first when Pareti’s team was able to sneak one by Bill Coolbaugh to tie the game at the intermission. With Derek Bugbee taking over for Coolbaugh to start the second, he was able to keep it a tie game. The teams played a back and forth game with no scoring until the 13:58 mark in the second when Team Pareti was able to fire a screen shot passed Bugbee to take a 2-1 lead into the third period. The Warriors started the third period with Kevin Finizio taking over in goal. Team Pareti came out with a big push taking a 2-goal lead at 4:13 of the period on a quick wrister form the slot. That was followed by two more quick goals 32 seconds apart to build their lead to 5-1. The Warriors were able to put a strong push on, but strong goaltending kept Pareti in the lead. Brian Moore added his second goal of the game with 4 minutes left, but that was all the Warriors were able to muster. The final was 5-2 Team Pareti. Brian Moore landed the Warriors MVP award with his 2 goal performance. Nice job Brian! On our return to the locker room, we got a surprise visit from John Tortorella, head coach of the Columbus Blue Jackets. It was quite an honor to visit with John and swap some hockey and military stories, as John’s son is an Army Ranger currently serving overseas. You could see John is the PROUD father of a U.S Army serviceman and fit right in with our Warriors discussing his deployment! The Warriors wish the best of luck to John’s son on the rest of his tour of duty!! The Warriors loaded up the bus in the early morning hours on New Year’s Eve for their trip to South Bend for an opportunity to skate with the Blackhawks during their practice for the Winter Classic game. The rain began to fall when we left the parking lot, not to stop until we returned. This unfortunately changed our plans of skating with the Hawks outside to skating inside on the Notre Dame arena. Upon our arrival in South Bend we were directed to the Compton Family Ice Arena, home of the Fighting Irish hockey team. After watching a few minutes of the Irish practice, the Warriors hit the locker rooms to prepare for their practice. The Warriors nervously waited for the signal from Coach Colliton to hit the ice. And that they did. After a short warmup skate, Coach Colliton dropped the pucks on a lively game of “two puck” between the split squads. It was a fast-paced game which featured our Warrior goalies playing in net and the Blackhawks’ goalies skating out. The game ended in a tie with no bad blood between the teams. I don’t know who enjoyed the skate more, the Warriors or the Hawks. Our goalies were able to fulfill some dreams by stopping penalty shots from some of their favorites like Patrick Kane, Jonathan Toews and Chris Kunitz! All involved had an experience of a lifetime! The Chicago Blackhawks’ organization, from top to bottom has again proven why they are the “Best Team in all of Sports”! 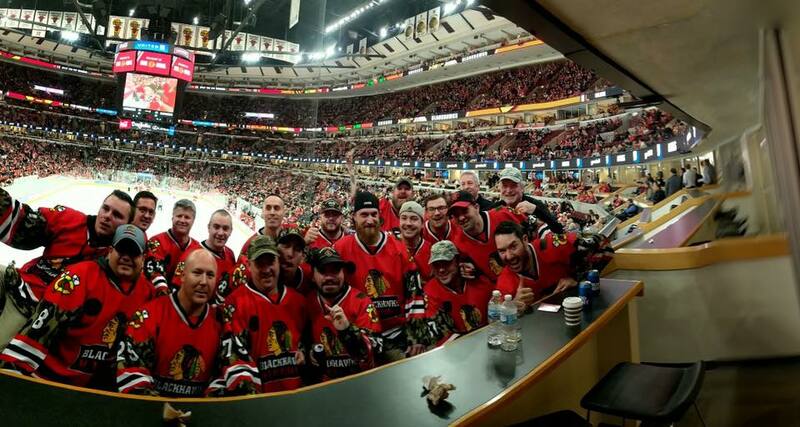 Their generosity and support for the Blackhawks Warriors goes unmatched by any other team. Every player and coach on the ice expressed their gratitude to our guys for the service and treated every guy like a teammate! Taking the time to talk, take picture and just hang out. Consummate Professionals! Thank you again for this most memorable opportunity. It will never be forgotten! December 15th was our second trip to Rockford to play at the BMO Harris Center prior to the Rockford Ice Hogs’ Hometown Hero game. This year our invitation went out to the Chicago Police Department tone our guests. The spirited contest started out with a back and forth, but scoreless first period. Both goalies were tested, but were able to turn away every shot they saw. The second period started out the same with some extended pressure by CPD. The Warriors we’re able to open the scoring on a diving rebound by Matt Gran on Kevin Fuller’s wrist shot from the the high slot. The CPD was able to tie it up a short time later when they slipped one by Nate Johnson. The second ended in a 1-1 tie. CPD was able to take the lead in the third on a wicked wrist shot that snuck past Kevin Finizio’s elbow, just inside the post. The play continued back and forth with the Warriors getting ample chances only to be stoned by CPD’s goalie. Matt Gran was able to fire a wrist shot past the CPD netminder with 2 seconds left in the third to tie it up. Gran, coming off the bench as the extra attacker, took a nice feed from Pete Manning, just keeping the pass in the zone and letting the shot fly. A nice screen by Kevin Sharwarko kept the goalie from ever seeing the shot. The shootout ended 2-1 with Warriors’ goals by Chris Tran and Matt Gran. Solid work by Bill Coolbaugh the first period and the shootout preserved a hard fought victory. Matt Gran earned the MVP honors with his 3 goal performance! Before the Ice Hogs game, our players joined Ice Hogs players on the ice for the Hometown Hero recognition. Our Assistant Coach, Dan Wigg had the prestigious honor of dropping the ceremonial first puck for the event. It was a great day from start to finish. Even the car cleanup after the game! Our next event will be a Skate with the Blackhawks at Notre Dame Stadium on December 31st prior to the Winter Classic game. On Sunday, November 18th, the Blackhawks Warriors played host to The Yetis hockey team at the Franklin Park ice arena. The Yetis team is a men’s league team that plays out of the Leafs Center in Dundee. The Warriors came out again with a quick goal by Anthony Baasch that was assisted by Kevin Sharwarko and Ryan Mussatto. This was followed later in the 1st period by a goal from Andrew Hawkins assisted by Chris Tran. The Yetis answered quickly to close the gap to 2-1 art the end of the first period. The Warriors were able to stretch their lead in the second with some nice playmaking and passing. Second period goals came from Baasch, a power play goal, Mussatto and Mark Peifer. Peifer’s goal was his first ever as a Blackhawks Warrior player on a nice wrist shot that beat their goalie high to the glove side. Sharwarko added assists on both Warrior goals along with a helper from Brian Moore on Baasch’s goal. The Yetis were able to sneak one by Bill Coolbaugh to make it 5-2 going into the third. Bill made some great saves not only on the Yetis initial shot, but also on some close in rebounds. His net minding kept the Warriors in the game and allowed them to build their lead. Bill was named Warriors MVP for his performance. Nate Johnson replaced Coolbaugh in goal for the third period and played just as tough as Coolbaugh, not giving up a goal on some prime chances for the Yetis. The Warriors capped the game scoring with goals by Chris Tran and a second from Andrew Hawkins. Justin Wigg added an assist on Chris’ goal. After the game, our assistant coach Dan Wigg offered up pizza and refreshments for the players and their families to top off a competitive, but fun game and afternoon. The Yetis team was so very generous as to donate approximately $2000. to the Blackhawks Warriors after the game. This money was donated by the players and some outside organizations that was a total shock to our organization. The 100th anniversary of WWI Armistice and Veterans Day were celebrated at MB Financial Ice Arena on Sunday, November 11th with a spirited game against the Chicago Police Department. The pregame ceremony featured an JROTC Color Guard along with the Chicago Police Department Drum and Bagpipe band to honor our veterans. The game got off to a quick start with the Warriors putting up 2 quick goals by Anthony Baasch and Bill Lipke in the first minute of play. Kevin Sharwarko and Justin Wigg assisted on Baasch’s goal while Andrew Hawkins and Chris Tran were the helpers on Lipke’s tally. The first period didn’t end until the Warriors added three more goals with the CPD answering with three of their own. Warriors goals were scored by Andrew Hawkins (unassisted) while Anthony Baasch completed his first period hat trick. Baasch’s goals were assisted by Pete Manning, Dan Rayas, Chris Polcyn and Sharwarko for his second assist. The second period started off just as fast for the Warriors with another Hawkins goal :55 seconds into the period. Assists went to Steve Roberts and Jeff Jucha. The Warriors added three more goals in the second to take a 9-4 lead to the third. Chris Tran tallied twice while Chris Polcyn added his first. Assists went to Kevin Sharwarko and Andrew Hawkins. A fairly quiet third period saw one goal by each team for a final of 10-5 in favor of the Blackhawks Warriors. Andrew Hawkins had the third period goal to complete his hat trick. The Warriors got a very solid performance in goal by Derek Bugbee who ended up snatching the team’s MVP award for the game. 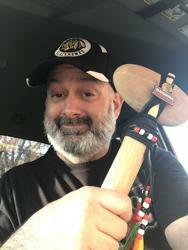 Derek was the first recipient of the new, handmade Warriors MVP tomahawk donated by captain Kevin Sharwarko! A big thank you to the Chicago Police Department for a great game! November 8, 2018 was not only “Military Recognition Night” that the Chicago Blackhawks were celebrating at The United Center, it was also Chicago Blackhawks Warriors recognition night. The Blackhawks organization invited our 2018 Warrior Classic championship winning team to be their guests for this memorable evening. It was humbling for our players and staff to join in the recognition of 50 Vietnam war veterans as they were honored during the pregame ceremony. It was a proud moment for all fifty of these heroes as they stood on the ice during the singing of our National Anthem. Something they will never forget! During the first period, our group was asked to stand as our team’s championship picture and live video feeds were displayed on the scoreboard as our achievement was announced to the crowd. I’m sure a very proud moment for all our guys! Between the second and third periods, Alternate Captain Justin Wigg participated in the “Shoot the Puck” competition. Not to be outdone by either of the other two veterans shooting, Justin ripped and a wrist shot into the net on his third attempt scoring a $100. pay day! Unfortunately, none of the three were able to convert on their second opportunities to win an additional $500. Justin was appreciative of his winnings and shared it with the team by buying everyone in the suites and shot of water!! The Hawks were unable to pull out the third period comeback we were all hoping for (especially Jeremy Colliton), but it was a great time had by all. As always, we look forward to representing the Chicago Blackhawks organization at future events and thank them again for the tremendous support they give our hockey veterans! We were honored to host a new Veteran Hockey Team’s first game at our home rink in Mount Prospect against the Peoria Iron Sights on 10/20/2018. Both teams gave a valiant effort, but the Chicago Blackhawks Warriors came back to take the win 8-6 from a rough start and a 2-goal deficit. Peoria has a good team getting started and it was a blast spending a few hours of ice time with these gentlemen. Thanks for coming out and we look forward to your growth and future competition! The game started out a bit shaky as Peoria Iron Sights put in a quick 2 goal lead on the Chicago Blackhawks Warriors. Chicago dusted off the cobwebs and brought their heads together to really work as a unit and efficiently cycle the puck in the corners, use the points to get the shot off and (hopefully) a quick rebound for a scoring opportunity. They did exactly that, and even then some. Chicago, both the team and individual lines, really “clicked” this game after a few minutes into the first period. The puck movement and passing game was “spot on” and really threw Peoria for a loop. After a good turnaround of momentum Chicago came back with a wicked line that turned opportunity into success. Centering the line was Hawkins who ended up racking in 6 assists, with Mussatto and Roberts on wing who each scored 2 goals. This line put in 3 goals in a single shift to help boost the Chicago bench morale! In the end Chicago took the W 8-6. Everyone skated their hearts out and had a blast with a great group of guys that were kind enough to make the 2.5 hours trip to Chicago for a single game on a Saturday afternoon. A huge shout out to the Peoria Iron Sights for making the trip! It was a fantastic weekend to host Peoria’s first game ever as an organization. Can’t wait to see how this new team will grow and we look forward to the friendly, neighboring competition. The Chicago Blackhawks Warriors came from behind to earn the Division B title by edging the Pittsburgh Penguins Warriors, 7-6. Read more about the tournament here. It’s a beautiful day to be alive and at Addison Ice Rink celebrating with the Team Karen Foundation! Prior to the opening faceoff, the crowd witnessed a stirring rendition of the Star-Spangled Banner sung by our own Warrior player, Greg Scott. Great job, Greg! That was followed by the “Opening Puck Drop” which was done by Karen and Kenny Carlquist’s son, Carson. Nice job, Carson! 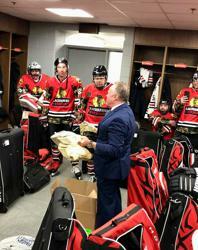 The Blackhawks Warriors faced off with the AWF Renegades in a fun hockey game for an even better cause. The game ended with the Renegades on top by a score of 8-5. Truly a game where the score didn’t matter. The fundraiser that followed was the main event. With generous donations of raffle prizes, silent auction gifts and chuck-a-puck, we were able to raise a total of $4500.00 to kickoff the Team Karen Foundation fundraising. The Foundation will support and donate funds to families battling Stage 4 Metastatic Breast Cancer. The Blackhawks Warriors appreciate this and future opportunities to assist this great cause!